There are a lot of things I love about this birth story- a birthday cake for baby, a quick labor with big sissy present. But what jumped out at me the most was a triple wrapped cord. I don't know how many women are told that they had to have a c-section because of cord wrapping, but probably far to many. This shows how normal and healthy a wrapped cord birth can be if attended by a skilled and hands off midwife. On Sunday night (the 23rd) I went to bed a little after 10pm feeling very grumpy and sorry for myself. I felt like I’d be pregnant FOREVER. Over the weekend, I’d lost my mucus plug and had a bit of bloody show, but no time-able or even notable contractions. I had walked and walked and very much wanted to have our baby before the end of the weekend so I wouldn’t have to go to work on my due date (the 24th). Around 8pm, I was feeling very miserable and decided to go ahead and call in a sub for Monday (I’m a teacher). I sat around and watched the World Series with my husband Chris for a little while, and then a little after 10, went to bed. About 10 minutes after lying down, I felt a REAL contraction. It was powerful and made me use my yoga-breathing. I didn’t think much of it, but about 8 minutes or so later, another contraction hit me, then another, and another. At 11:00, I got up after having 5 hard contractions and decided I would face them in the living room. I watched the last inning of the world series with my husband and the contractions had picked up to about every 5 minutes, but still very easy. I could easily just breathe through them. After the world series game ended, I was hit with a horrible bout of diarrhea. I spent the next 15-20 minutes or so having very intense contractions on the toilet. At this point, I was pretty sure this was really labor and Chris started to make the ice tea I’d requested for laboring. The tea smelled so delicious and the homey smell was really calming to me. Then, he started in on baking a birthday cake for the baby. At 11:30, I called our midwife Erin to give her a heads up. I talked through a contraction on the phone with her and she asked if I was ready for her to be there. I wasn’t. I wanted to be alone with Chris and told her I’d call when I was ready for her. From there, things seemed to get more intense. I said okay and tried to hang up the phone but the contraction was too intense for me to even find the end button. Chris took it from me and I asked him to set up the tub. He put the cake in the oven and started getting the tub filled. While it filled, I tried a few contractions laying down on the couch. I focused on breathing into the baby and systematically relaxing all of the tense muscles in my body. I found that with each contraction I was tensing my thighs and they were starting to shake. I consciously relaxed them and the pain lessened. After 2-3 contractions like this, I wandered into the room with the tub and could see a bit of water in it already. I mused about the “no diving” sign on the bottom of the tub and I completely understood why such a warning was necessary. There was nothing I wanted to do more than to dive into that tub. I knew the warm water would bring me great relief. Finally there was enough water to get in. I climbed in and the relief was INSTANT. The warm water was so soothing for my tired legs and helped me to relax even more, especially between contractions. I loved being able to float my legs a bit. I asked Chris what time it was. He said it was about 10 minutes after midnight. I was delighted. It looked like October 24th would be our baby’s birthday. When the contractions hit in the tub, I turned over onto my tummy and buried my head into the tub wall and floated my belly & legs. I must have looked very strange, but the release of gravity and floating felt great and I could moan into the wall of the tub. I did 2-3 contractions like this and they were getting very strong. Around 12:17, our midwife Erin came. I didn’t even greet her because I was mid-contraction and I just couldn’t. When it was over, I called her in and asked her to check me. I needed to know how far along I was. Mentally, I just needed to estimate how much more time I had. Was it going to be hours? I had also felt pushy just a tad during that last contraction and didn’t want to be pushing on a 4cm dilated cervix. She checked me and seemed a bit surprised when she said “you’re almost complete!” Chris looked at her and said “huh?” His eyes were wide and we exchanged a look that said “wow, this is going fast!” I rolled back over because another contraction was hitting me and said “sweet!” With that contraction, the urge to push began slightly. I felt my water break and then suddenly the urge to push was overwhelming. I rolled back over to semi-sitting and I roared (seriously, I probably woke the neighbors). Chris reminded me to put my hand down to receive the baby and I was so grateful that he reminded me this. I could feel the baby’s head bulging and it was like a cantaloupe was emerging. It was a little scary to feel that, but I could also feel the bit of head that was out get bigger and bigger. With my hand down, I could feel where I was starting to tear and guide the baby’s head away from those spots. During that contraction two things happened. First, our 3 year old woke up (she later said “mommy, you were very loud!”). Chris went to get her out of bed and brought her in to the birth room. Then, the baby crowned and the head was born. At the end of that contraction, I looked up and saw Anna was clinging to Chris and holding her ears. I gave her a big grin and said “Our baby is coming!” She grinned back at me, relieved (I think) to see that I was still her normal mommy. I rested for a minute with the baby’s head out underwater and I felt it. I could feel eyes, nose, and mouth facing down. The next contraction hit and I expected the baby’s body to just slide out like Anna’s had, but I had to push even harder. The baby’s chest felt HUGE, but after the chest was born, the baby slipped out. I reached down for him and brought him up toward me. It was 12:26! Labor has only been about 2 hours, pushing for a few minutes, and it was less than an hour of contractions that I couldn’t talk through. I was kind of in shock that it had happened so quickly. The baby’s cord was around the neck 3 times and Erin asked me to stand so she could untangle him. 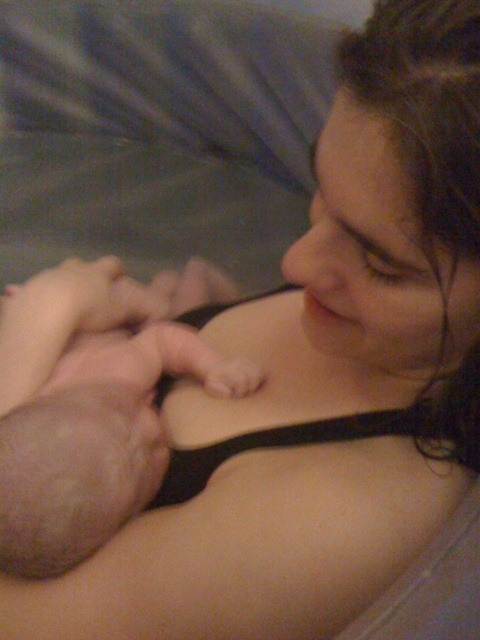 She untangled him quickly and I sat back down in the tub to look at our beautiful baby. I think I said “IT”S A BABY!” Then I checked and saw that it was a BOY!! Our beautiful little boy Matthew Robert was here! Anna was instantly in love and came over to touch and kiss him right away. He was peaceful and gave a little cry after a minute or two. Then he just sort of squinted his eyes and looked around. He looked so tiny to me. For a moment, I worried that he was small. After a few minutes in the tub, we heard the timer on the cake go off! Matthew had arrived before his birthday cake had finished baking! Chris went to get the cake out of the oven. I stood and walked to the bed to deliver the placenta and get checked. No tears! The placenta emerged after about 30 minutes and Matthew nursed for the first time like a champ! He is clearly a nursing pro. Erin weighed him and he was 8 lbs 8 ounces! He was almost a full pound bigger than Anna was. He was 21.5 inches long with a 14 inch head and a 14.5 inch chest. No wonder his chest felt harder to birth! He was beautiful. He just rested in my arms looking around for the next few hours. His face was a bit purple because of his fast entry into the world. After the midwife left, Anna, Chris, Matthew, and I had a small birthday celebration. Anna and Chris brought in his cake and we all sang happy birthday to him. We each ate a piece of cake and then all snuggled into bed together for our first night as a family of four! Matthew’s birth was amazing and recovering at home has been delightful. Chris has taken great care of me and I feel amazing. I don’t feel like I gave birth today at all. I’m not sore. Being home has been so nice. Matthew hasn’t been further away from me than a few feet since birth and has mainly been in my arms or sleeping on my chest for his entire life. His skin is so soft and he smells delicious. We are enjoying him so much. I had a friend who was told it was so good that she had a c-section as the cord was wrapped three times around her son's neck. He was slow to engage in the birth canal, so maybe there was some truth in that in her case? Both of my baby's cords were wrapped around twice but both born vaginally. What a beautiful story. Sometimes a wrapped cord can cause problems, but in the majority of cases they are easily slipped over the head and don't affect the labour at all. Awwwww Congrats! What a beautiful story! My son was born at home about a month ago with the cord around his neck twice. It couldn't be slipped off until he was all the way born, and he was a little white at birth. Not an emergency though. THE most beautiful birth story I've read in a long time. Great job, Momma. Beautiful birth story! I love that they all sang Happy Birthday and had a fresh baked cake right after he was born!